Adjusting to fewer hours of daylight and cooler temperatures makes traveling in and out of London off-season challenging. Although being a part of the human race in the United Kingdom during peak vacation time, is enough to make anyone want to stay at home. In a recent trip in and out of London, off-season was easier, more accessible, less crowded, and budget friendly. Layer up and see, hear, feel, smell, and experience London. It’s impossible to catch it all, so be prepared to stop/go and move slowly/quickly through this cool city. Every step taken is a reminder of this city’s rich past and its vibrant present. London offers clean, reliable, efficient, expansive, cheap, and a safe public rail system. For more convenient train travel load up an “Oyster Card” through a machine or attendant at a train station. With the proper amount of money, you can transport just about anywhere: http://www.tfl.gov.uk/tickets/14836.aspx. Although the cabs have that vintage design, they are quite practical with plenty of legroom and have enough space for even the largest suitcases. Make sure you have cash on hand because not all cabdrivers take credit cards. Take in the chilly air, and get those jet-lagged legs moving with a stroll through Green and/or Hyde Park. Depending on the off season you choose to travel, the park scenery will vary accordingly, but at least you will experience a Londoner’s version of urban nature. The Wellington Arch is a gateway to Buckingham Palace, Big Ben, The Eye, and Green and Hyde Parks. Go inside the small museum and circle up the staircase for their latest exhibits and history. Head to the top and gaze at the 360 degree view of this busy intersection: http://www.uniquevenuesoflondon.co.uk/wellington_arch/. London is a “walk about” kind of city, and it has so much history and contrasting styles of architecture. Pull out your smart phones or cameras and start shooting. Unfortunately, Big Ben, The Parliament Building, and Buckingham Palace are not open to the public, but Westminster Abbey has public viewings and guided tours with limited hours. Be forewarned that the website information doesn’t always match up to the information on the sign posted outside of the church. If you are walking by the Abbey, join the tour because there may not be another opportunity. Originally or “officially” built in 1240, Saint Paul’s Cathedral was destroyed by fires (something London is known for) in 1667. With 4 fires burning down England’s largest Protestant Church, it has been rebuilt five times. Saint Paul’s is best known for Princess Diana and Prince Charles’ wedding, Martin Luther King Junior’s speech upon Winston Churchill’s death, and its large crypt. Feel like Quasimodo and climb up the narrow, circular staircase for more stunning views of London: http://www.stpauls.co.uk. With its views at the river’s edge or on top of the many bridges along the way, daytime or nighttime, there is so much to see alongside the Thames. 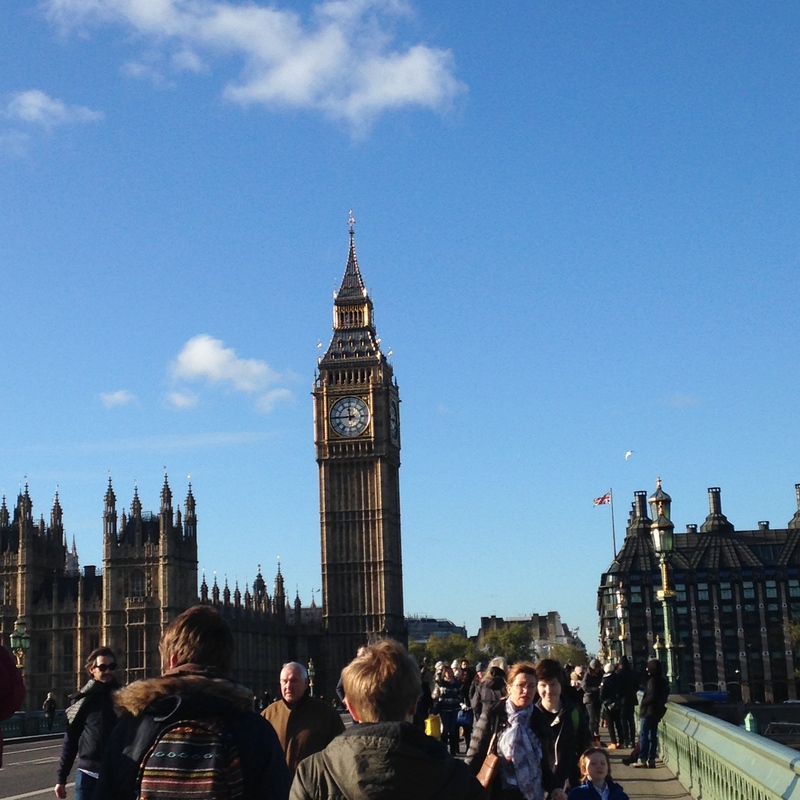 Spend a couple hours walking from Westminster Bridge to Millennium Footbridge. Nighttime gets packed with bumper to bumper people, so if crowds are your scene, then this is definitely a walk for you! le in London. You can easily “kill” a day here meandering the cobblestone streets and visiting sites, like: the Crown Jewels: http://www.hrp.org.uk/TowerOfLondon/. Marvel in and at the ancient cultures. The museum helps connect the dots on ancient society’s impact on modern times. There are several short, free guided tours to choose from. For example, the Parthenon Tour will walk you through interpretations of ancient Athen and Spartan culture: http://www.britishmuseum.org. While London is considered an expensive city to visit, this probably is one of the best bargains around. It is hard not to be in utter AWE with the masterpieces of the world’s famous and infamous artist on full display: http://www.nationalgallery.org.uk. Meet the leaders that shaped England’s History: The Rich, The Famous, and The Powerful: http://www.npg.org.uk. Modern Art, like it or not, it’s always interesting, and The Tate has an impressive gallery of unique works from artists around the world: http://www.tate.org.uk. This pedestrian bridge connects the Bankside area to the City of London. This ultra modern bridge was built in the 21st century and connects the sites of the past, like: St. Paul’s Cathedral to sites of the present: Tate Modern: http://www.londonmillenniumbridge.com. Somehow, a 2 ½ hour high-octane, entertaining tour through London’s East End does not seem long enough. Surrounded by mind-boggling Street Art, it is impossible to see and experience all the true innovative spirit in East London. The founder/guide of Alternative London tours told fascinating yarns on the history of beer, street art, ethnic discourse, and the cast of colorful characters which has made this the most edgy, gritty, and notorious area of London. This was an unforgettable day excursion. Before or after your tour, wander around the streets and alleyways to check out the interesting shops, ethnic food, rowdy pubs, and of course the unusual street art. Looking for Indian food? There are over 60 Indian restaurants packed tightly in this neighborhood so deciding where to eat may be your most difficult challenge while visiting London’s East End: http://www.alternativeldn.co.uk/index.php. London is a shopper’s paradise, but a shopping spree can run up quite a tab. At Old Spitalfields Market, one-of-a-kind bargains are plentiful. Check the schedule for events, but weekends offer a wide selections of artisan food, t-shirts (the unique kind), clothing, jewelry, and so much more: http://www.oldspitalfieldsmarket.com. Tucked away in the St. Thomas Church is the oldest Operating Theater in Europe. The theater was designed to teach students surgical procedures in a public amphitheater. Today, Medical Schools still use this same method of demonstration. A prerequisite to be accepted into this hospital was the patient had to be poor, a reference for “good character”, and had an incurable medical condition. Eventually, St. Thomas Hospital took in mainly women. Peruse the exhibits, primitive instruments, jarred body parts and the metal operating tables. The descriptions of bloodletting, lack of hygiene, and drug-free and painful surgical procedures, will make your skin crawl: http://www.thegarret.org.uk. Fall onto the squishy chairs, gaze up at the masterpieces painted on the ceiling. Listen to the history of how the Banqueting House was known for its elaborate, masquerade balls for dignitaries: http://www.hrp.org.uk/BanquetingHouse/. It is a small museum that houses some of the Queen’s horses. Observe the perfectly polished boots, armor, and buttons of the guards and cavalries’ of the Royal Family: http://www.householdcavalrymuseum.co.uk. Warhorse tugs on your emotions with its astounding acting, script, plot, and set. You’ll walk out of the show feeling the power of British Theater. It was worth every pence and then some: http://www.warhorseonstage.com/tickets/london. This long and hard to remember title just doesn’t begin to describe this captivating play. A special-needs, teenage boy with a high Math IQ, plays detective and unearths disturbing family secrets along the way. Be prepared to be awed and wowed by this creative grid-like set, original plot, and superb acting: http://www.apollotheatrelondon.co.uk/the-curious-incident-of-the-dog-in-the-night-time/. Follow the dedicated locals to Monmouth’s Cafe. One advantage of going to their cafe is the proximity to Borough Market…an artisanal food zone: http://www.monmouthcoffee.co.uk. Cured meats, breads, desserts, Thai Food, Middle Eastern treats, fresh fruit, and more are all part of the local and international foodie flavors in this Southwark neighborhood. Have your mouth open, stomach on empty, and arms free for some serious sampling of edibles, and souvenirs on your trip in London and for back home: http://boroughmarket.org.uk. A Turkish (Anatolian) Restaurant near the theater district draws the crowds and delivers impressive Mediterranean food. Tas has so many menu choices, but here is a short list of some delicious delicacies: the lamb shanks, chicken, and hummus: http://www.tasrestaurants.co.uk. Zucca exudes freshness, originality, and authenticity from first (fried Butternut Squash and Sage Leaves) to last course (Pasta with Asparagus). The sampling selection, and flavor of the breads alone were enough reason to keep coming back. Zucca offers a nice break from the plethora London pubs that line every street: http://www.zuccalondon.com. An Italian (Sardinian) Restaurant, which is a cute place serving simple and tasty Sardinian food: http://www.olivorestaurants.com/cgi-bin/olivo/index.html. About a mile or so away from the national theater, this Eastern European restaurant has more than a large selection of Vodka. Their Steak Tartar, Roasted Chicken Paprika, Pierogies, and simple decor makes this a memorable dining destination: http://www.balticrestaurant.co.uk. If you are looking to splurge on a special night out, make a reservation at one of the oldest Indian restaurants in London. Dating back to 1926, Veeraswamy, provides a quiet, romantic escape from the hustle and bustle of London. The spices, flavors, and colors of their dishes sends you right to nirvana. The staff will guide you through the many delectable options: http://www.veeraswamy.com. British Breakfast of dry/dried toast, poached egg, and bacon just gets tiresome and tasteless after a few days. Thank goodness, The Table provided a much needed and desired respite with its Brioche French Toast, Waffles, homemade pastries, and surprisingly, decent coffee. An everyday kind of cafe that serves simple, fresh comfort food: http://thetablecafe.com. There is no better place for cheese than La Fromagerie. This market, cafe, and cheese shop has a quaint, country-style ambiance. Sit down and enjoy a cheese plate with La Fromagerie homemade crackers paired with specific wine. For on the go options, head to the refrigerated room where a Cheesemonger will find local and international cheeses made for your own palate: http://www.lafromagerie.co.uk. Sometimes you just need a vacation from your vacation. London, a fast paced city with lots of life and activity, can leave your mind and body exhausted. Just a few hours away or a short distance away are some fascinating sites and charming towns. With a GPS and a bit of patience, you can become an expert at driving on the right side of the road. There are many convenient Rental Car agencies in London. Give yourself some time to get adjusted to the other side of the road and roundabouts. Founded over 250 years ago, the Royal Garden, Kew is enchanting and extensive. Experience a self-guided canopy tour atop the trees. Meander through Kew’s Glasshouses that are home to lush, unusual plants from around the world. Want to be on “pins and needles”? The indoor cactus garden gives you a compilation of desert plants without having to visit the deserts in the Southwest of the United States: http://www.kew.org. With well over a million visitors coming to the Roman Baths, it is well worth spending a few hours visiting this ancient Roman Spa. Navigate through the rooms and poolside with a self-guided audio tour. The “day in the life…” provides a fascinating perspective and description of professions, hairstyles, fashion, gatherings, and events that took place in this small outpost of the Roman Empire. As it did over 2,000 ago, thermal water still flows and steams up the inside and outside of the complex: http://www.romanbaths.co.uk. Jane Austen spent 8 memorable years with her parents in Bath. This quaint and modest house is a tribute to her life and work. In a small room, the staff shares the family history, Jane’s humble life, and insights on her brief, lasting imprint with her adoring fans. Don’t leave Jane’s house without leaving a note using the feathered Quill pen and playing dress up in the fashions of the Victorian Age: http://www.janeausten.co.uk/jane-austen-bath/. Across the street from the Circular park is The Circus Cafe and Restaurant. The name is a bit of a misnomer because this restaurant is romantic and anything but chaotic. The highlights from their Gourmet British menu were the Fillet Mignon, roasted vegetables, and fat chips (fries). Their Apple Soup topped with Apple Chips, Crostini, and Blue Cheese was the Pick of the Day. http://www.thecircuscafeandrestaurant.co.uk. “Cots” means sheep enclosure and “Wold” is defined as gentle rolling hills. Meander by car and by foot through the charming and oddly named towns of Bourton-on-the-Water, Stow-on-the-Wold, and Moreton-in-Marsh: http://cotswolds.com/travel-guide/travel-maps. No need to reserve rooms at Inns or in hotels, off season offers both value and vacancies at the most popular/expensive lodging spots during peak season. Dating back to 947 AD, check out or Inn to The Porch House, located in Stow-on-the-Wold. It is the oldest hotel in England: http://www.porch-house.co.uk/home. Blink and you may miss The Holford Arms Pub in the town of Knockdown (Tetbury). This 16th century pub serves up some hearty, fresh, traditional-style, tavern food. The warmth of the fireplace radiates through the home-style and intimate setting: http://www.theholfordarms.co.uk/node/3. While in Morton-in-the Marsh, make a Pitstop at the The Cotswold Cheese Company. This shop highlights the many local artisan cheesemakers that have made the region famous. If you’re heading to Blenheim Palace, pick up some savory goodies for a most flavorful snack/lunch or select some edible souvenirs on your travels in the UK or for back home. The staff knows their cheese and is happy to slice up samples to try: http://www.cotswoldcheese.com/epages/BT4571.sf/en_GB/?ObjectPath=/Shops/BT4571/Categories. Once upon a time, Queen Anne in the early 1700 bequeathed land to the Duke of Marlborough. Being one of England’s bravest and most famous war heroes, this Duke used this vast area to build a Palace. The Duke named his palatial estate Blenheim…after the battle which made him a national hero. The grounds are massive, and you could easily spend days strolling through this fairy tale- like setting outside the town of Woodstock. The guide walks you through the masterpieces of art, decor, and riveting stories of descendants, like: the Vanderbilts, Churchills, and Spencers (Lady Diana’s family). Even today, one can feel like royalty by renting out specific rooms for a wedding or special events. In and out of London off-season is super chill. Instead of flying south for winter, bundle up your body and stimulate all your senses with some memorable travel in this most electrifying city and its surroundings. Off season seems like a phenomenal time of the year to visit London and environs.